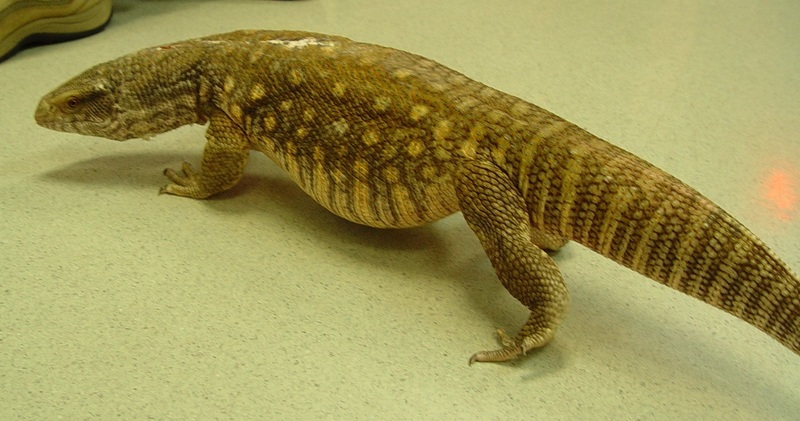 Savannah monitors, also called Bosc monitors, are large carnivorous lizards that resemble tegus more than typical monitors. When handled regularly, these large bodied, stocky lizards can become quite docile and even enjoy the physical interaction in some cases. 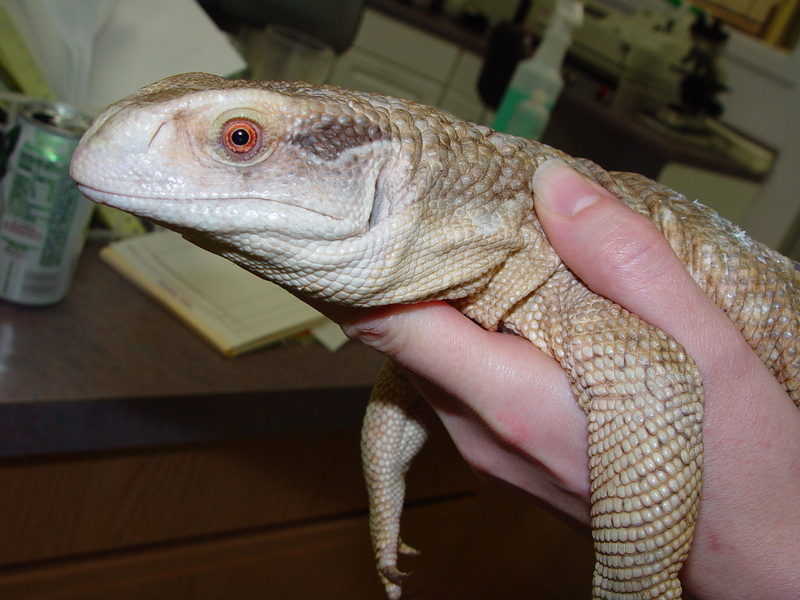 The necks of Savys are slightly longer than those of tegus and much thicker than those of other monitor species. Savannah monitors have a broader rounder snout with forked tongues that are deeply grooved. Generally, they are a light tawny to light brown coloration. Monitors are incapable of autonomy (“tail drop”). Most Savannahs reach a size of 3-4 feet from snout to tail tip and live around 8-12 years although some have lived longer. Savys are found throughout northern Africa . These large, terrestrial lizards inhabit the dry, grasslands (savannahs) but frequently burrow to escape the heat of the day and for security. Savannah monitors enjoy swimming and lounging in water. In the wild, Savannah monitors are carnivores consuming small mammals, eggs, insects, carrion, small birds, small reptiles, and fish. Although these lizards are carnivores, they have a penchant for roaches, earthworms, super worms, and other insects. These aggressive eaters will consume nearly anything placed in front of them. However, variety and balance are key to a healthy monitor. Hatchlings and juveniles are primarily insectivores in the wild but in captivity can be taught to eat other foods as well such as Mazuri carnivore mixed with insectivore chow. Hatchlings should be fed every day with a strong focus on gut loaded insects. Crickets, dubia roaches, giant meal worms, and earth worms should make up the bulk of the diet. Pinkie and fuzzy mice can be offered but it is recommended to wait until the hatchlings are a bit larger and older. Small amounts of boiled or cooked eggs and small amounts of fish can be offered as well to round out the meal and offer variety. Savannahs under 2 years old should still be fed 3-4 times a week until they reach sexual maturity and roughly adult size. Whole prey such as mice, make excellent feeders for smaller Savannahs whereas the larger ones can be fed various adult mice sizes. Cooked or boiled eggs, fish pieces, earth worms, roaches, giant or super meal worms, and other insects should be added to the diet. Adults should be fed 1-2 times a week depending on their body condition (obese monitors should eat less often than under weight monitors). 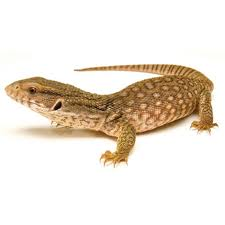 The bulk of an adult Savannah monitors diet should consist of rodents (mice to small rats), the occasional baby chick, insects, eggs, and fish should all be offered as well. Pieces of cooked chicken can be offered as a treat for enrichment as well as training in some individuals. Obesity is a common problem in Savannah monitors and food should be fed as meals when adulthood is reached rather than constant supply. There are various methods and recipes for feeding monitors and commercial diets are an easy option for most keepers. A primary diet of Mazuri Carnivore for adults is recommended with the addition of Mazuri Insectivore diet when feeding young monitors. Lean ground turkey is a welcome addition to any tegu diet as long as it is not the bulk of the diet. All Savys should have their meals dusted with a calcium supplement and a multi-vitamin supplement used once to twice a week. ​These lizards are terrestrial although they can climb low level branches. Savannahmonitors are diggers by nature and are decent swimmers as well. A soak in a large bin or tub twice a week will give monitors plenty of exercise and naturalistic enrichment. Hatchlings can be easily housed in a 20 gallon aquarium or enclosure of a similar size although they will quickly require larger accommodations. As monitors grow they will need a 55 gallon tank or larger (keeping in mind floor space is important) or a custom enclosure. Once your Savannah hits 1-2 years old it is recommended to create a custom enclosure that or at the very least, a 75 gallon aquarium. It is highly recommended to offer an enclosure that is roughly 6-8 feet long, 3-4 feet wide, and 2-3 feet tall for adults. Savannah monitors require space to roam and sprawl out. Make sure that all enclosures are sturdy and escape proof. A locking door is recommended especially for wild caught or aggressive adults. There are numerous substrates to offer monitors in their enclosure ranging from complicated naturalistic set-ups to simplistic newspaper. Newspaper, although unattractive to look at, is easily cleaned out and savannahs genuinely seem to appreciate hiding under the layers of paper. Butcher paper can be used as a uniform color alternative. Since Savannahs enjoy burrowing and will spend most of their time hidden under the substrate if allowed, they seem to benefit from the addition of dig boxes. Dig boxes are designated areas or enclosed sections of top soil that can go as much as 2 feet deep! These boxes allow the savanah to fulfill natural desires to dig as well as offer another form of enrichment. Entire enclosures can be covered in top soil but it is hard to clean out effectively and tends to accumulate missed feces as well as offer feeder insects escapes from hungry monitors. ​If particulate substrate is desired, aspen and orchid bark are safe alternatives with some owners finding a happy medium with a mixture of orchid bark and topsoil. In this author’s humble opinion, the most enrichment can be achieved by covering the bottom of an enclosure with indoor/outdoor carpet and offering a top soil covered section of the cage (preferably with a lip to keep the soil from covering the rest of the cage). This not only offers multiple substrates to walk on but also offers the keeper ease of cleaning especially if a cement mixing tub or similar is used for the dig spot. All substrates should be changed at least every 2 weeks completely and spot cleaned daily. Savannah monitors housed on particulate bedding or soil should be fed in a dish or a separate bin especially if live feeder insects are used. UVB lighting is typically not required for the care of monitors especially those fed whole prey diets. However, improper diet can lead to calcium deficiencies and the addition of an ultraviolet B radiation bulb such as a ReptiSun 5.0 is recommended. Although not necessary, it is recommended to offer exposure to ReptiSun 2.0 or 5.0 during day light hours. Savannah monitors can happily be housed in ambient temperatures ranging from 80°F on the cooler end of the enclosure and 85°F on the warmer end of the enclosure. Ambient temperatures can easily be maintained utilizing under tank heaters, heat cable (only on the outside of the enclosure), heat tape, heat bulbs, ceramic heat emitters, and heat emitting panels. The basking site should be maintained between 95°F and 100°F ideally. At night, the enclosure should never fall below 75°F. All heat sources should ideally be kept on a thermostat that allows for proper gradients while offering piece of mind to owners as well. A thermometer should be placed ideally one inch above the substrate on the cooler end of the enclosure. Another thermometer should be placed once inch above the substrate on the warmer end of the enclosure and the one last thermometer at the basking site. Coming from the savannahs of Northern Africa , these lizards should be maintained at 50-60% relative humidity. This can easily be monitored using a hygrometer. Humidity can be maintained with large water bowls or bins, misting systems, foggers, humidifiers in large enclosures, and spraying the enclosure 2-3 times a day. Moist topsoil, if offered, will also help preserve the humidity. Finding ways to keep monitors entertained and active is as simple as wrapping earthworms or a piece of fish in a lettuce leaf or as complicated as modifying wiffle balls to hold roaches or meat chunks to move around. Creativity is essential for excellent monitor keeping. Tree trunks, tree branches, and root stocks make excellent obstacles, hides, and climbing surfaces. Make sure that all climbing surfaces are more horizontally angled as they are not necessarily agile climbers especially as they get older. Dig boxes are essential for working out extra energy and allowing for natural behaviors. Large soaking basins or twice weekly soaks in a kid pool or large rubber maid offers enrichment and another way to exercise Savannahs. Hide boxes are also a requirement, especially those that do not have anything to burrow into or hide under. Although a hide box is offering a place to retreat, this is a form of enrichment as well. The addition of straw and hay in the enclosure allows the Savannah monitor to experience new smells and sensations as they walk and dig through it.